For new and aspiring entrepreneurs, effective time management is a great foundation of success. It takes a lot of courage not to procrastinate and to do tasks according to priority and schedule. Procrastination is quite typical, especially for people who work on environment, having a lot of employees or using a lot of devices. In the modern world, there are so many distractions such as the social media platforms, noise, unwanted visitors, phone calls, unimportant emails, and other things which can greatly affect if not kill productivity. Therefore, it is quite vital for entrepreneurs and even workers to read the book entitled, Eat That Frog! 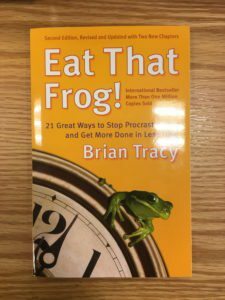 : 21 Great Ways to Stop Procrastinating and Get More Done in Less Time written by Brian Tracy wherein he recommends that in order to be successful, people should eat the biggest and ugliest frog of all. So the goal is to eat the biggest and the ugliest frog first thing in the morning and sure, nothing worse will happen the rest of the day. This is a guide that invokes empowerment, thus optimizes service and performance. The said “biggest and ugliest frog” is the hardest, biggest, and most important task a person needs to do that should be accomplished first before doing the easy ones. Doing the major and most important work motivates and triggers the release of “endorphins”, a morphine-like substance in the brain that will make a person feel more active, creative, positive, and confident. Moreover, self-discipline is one way of accomplishing and resisting the urge to do anything else. Prioritization is, therefore, essential to determine which work should be done first. People usually get overwhelmed with having so many things to do, but there’s not enough time. The said rule is proven to let an individual catch up with tasks and responsibilities yet enjoy a higher quality of life with loved ones at the same time. Set the table. Preparation is the key to achieving goals. In order to do that, Brian determined the great rule for success, that is, “to think on paper”. Goal setting and planning should be clearly written as unwritten goals can lead to mistakes, confusion, and vagueness. These plans should be acted upon immediately without ceasing. Apply the 80/20 rule to everything. This rule, also called the “Pareto Principle”, is quite helpful in time management wherein 20% of your activities will account for 80% of results. Consider the consequences. Predicting the potential consequences of a deed determines the significance of a task, hence enables you to identify your next “frog”. Have a future orientation; think about what you want and how do you want to live your life in the next five, ten, or twenty years and reflect if what you are doing today is coherent to that desired goal. Practice creative procrastination. Ascertain which tasks should be procrastinated, delegated or eliminated to free up more time for higher value projects. Use the ABCDE method, continually. Categorize the tasks according to its importance. The “A” is considered as the most important task that should be done first. “B” is the second most significant, but with milder weight such as answering an email or a phone message. On the other hand, “C” tasks are things which are delightful to do, but do not carry the weight on your work such as social interaction with workmates and personal phone calls. “D” is counted as the things you can delegate to other people, and lastly, “E” is categorized for anything that can be eliminated altogether because they are insignificant. Focus on key result areas. Determine the key result areas you have in order to do your job successfully. It’s like identifying your strengths and weaknesses to be able to address that weakness and improve yourself. Apply the Law of Three. Figure out the three most essential tasks and concentrate on them. Prepare thoroughly before you begin. Prepare your workplace, whether it’s in your home or in an office, because a more organized environment will make you more positive, efficient, and productive. Take it one oil barrel at a time. Choose one task that you usually procrastinate and make a step on completing it. Do the same for the other projects. Upgrade your key skills. Never cease learning in order to become more competitive. Leverage your special talents. Determine the things you are good at and what you enjoy. Focus on them as they are the key to unlocking your full potential. Identify your key constraints. After doing this, you will be able to take an immediate action and have a positive outcome. Put the pressure on yourself. Be motivated and work without supervision. Never depend on other people’s push. Maximize your personal powers. Work during the specific times that you are at your best, the time when your brain is more active and energized. Motivate yourself into action. Always be optimistic in action, words, and reactions. Get out of the technological time sinks. Become a master of the technology and not the servant. Control the usage of devices and technology and take time to relax without any interruptions to clear your mind and become calmer. Slice and dice the task. Cut a big task down using the “salami slice” or the “Swiss cheese” methods. These will make you work on a larger and more complex job that you’ve been procrastinating. Create large chunks of time. Schedule your work, plan in advance, and consolidate large chunks of time to work on more essential tasks. Develop a sense of urgency. The faster one works, the more will be accomplished, hence, the higher is the confidence and personal pride. Handle every single task. Always take action immediately without distraction on the most significant task and never stop until it is 100% completed. Practice these habits and it will surely become a part of you. This is critical to attain goals and of course, success. Eat That Frog is a short book which contains a collection of ideas and techniques that Brian Tracy learned from successful people regarding productivity and effective time management. 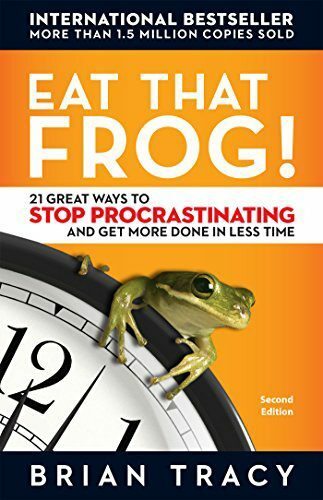 It is based on Mark Twain’s quote: “Eat a live frog first thing in the morning and nothing worse will happen to you the rest of the day.” The book also helps a person overcome procrastination, thus increasing personal output. It is especially designed to inspire from the author’s real life experiences through simple terms and words which a person can implement at once.